Mechanical watches depend upon the stored energy in the mainspring to power the movement and should be wound daily. To set the time gently pull up on the crown and turn the hands in the clockwise direction. Push the crown back down into the normal operating position. To wind the watch turn the crown in the clockwise direction 16-18 turns -DO NOT OVER WIND- over winding will damage the mainspring. 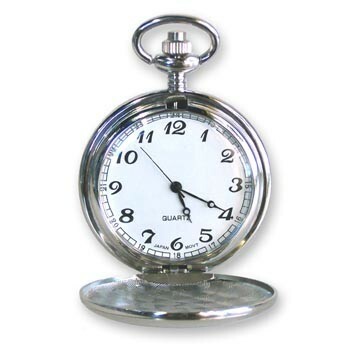 Mechanical pocket watches typically have an accuracy +/- 60 seconds within a 24 hour period. This is due to temperature, humidity, atmospheric pressure and altitude affecting the movement. Enjoy your new watch from AnniesHours.com !